In the previous article we describe to how to Setup RAID-1 in RHEL/CentOS systems. Some times disks attached with the array get failed working, RAID simply mark it as faulty device and do not use it any more. In that situation we need to replace the faulty device with new working device. The below image is showing that /dev/sdc1 disk has been marked as faulty and new disk attached has taken place of that with complete data sync. In this article you will get to how to check which device is faulty and how to remove them from raid array. This article will step by step help you to How to Replace Faulty Device from RAID Array. 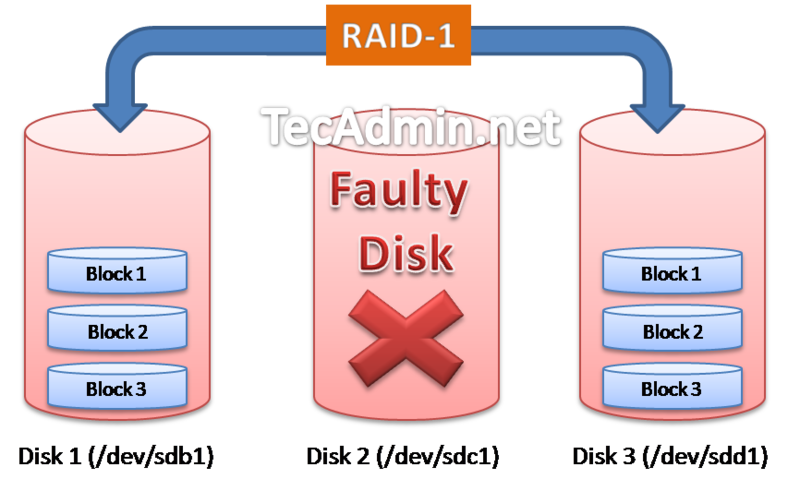 Its importent to identify the correct disk which is marked a faulty by raid, use mdadm –status to check status of all disks attached in RAID. If you looks the above output, the disk /dev/sdc1 is showing faulty and added as spare disk. So our target it to remove /dev/sdc1 and add a new disk in place of that. Also make sure to set file system type as Linux raid autodetect. I have attached a new virtual disk /dev/sdd in system. Lets make a partition on disk as /dev/sdd1 of same size of faulty disk. Building a new DOS disklabel with disk identifier 0xe70cdc62. As we have removed faulty disk from RAID array, Lets attach new disk /dev/sdd1 in place of that.